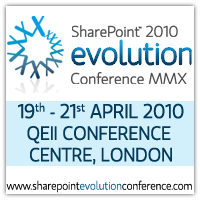 I'm really looking forward to the next SharePoint conference in London next year, the SharePoint 2010 Evolution Conference. This past April I was lucky enough to present at the SharePoint Best Practice conference in London. This SharePoint 2010 Evolution Conference replaces the best practices show next April... makes sense in the branding as it is a bit too early to talk about best practices that early in a release schedule. I'll personally be presenting two sessions at this show as well as moderating an Ask the Experts panel on the last day... hope to see you there! What's new with Web Content management in SharePoint Server 2010 In this session attendees will learn what improvements Microsoft added to SharePoint Server 2010 for hosting content-centric sites including one-click authoring, leveraging metadata, improvements to the Content Query Web Part and event the new Web Analytics service for monitoring the status, health and activity of a content-centric site in SharePoint Server 2010. Upgrading and Improving SharePoint 2007 WCM sites to SharePoint Server 2010 WCM SharePoint 2010 delivers a rich new environment for managing and authoring web content, along with a wide range of platform improvements. In this session, we will demonstrate a live upgrade of a SharePoint site from SharePoint 2007 to SharePoint 2010. Along the way, we will discuss key upgrade considerations, review the changes required to implement the fluent UI for content authoring and show how to enable new features like video streaming, tagging, ratings and wikis in a publishing scenario.